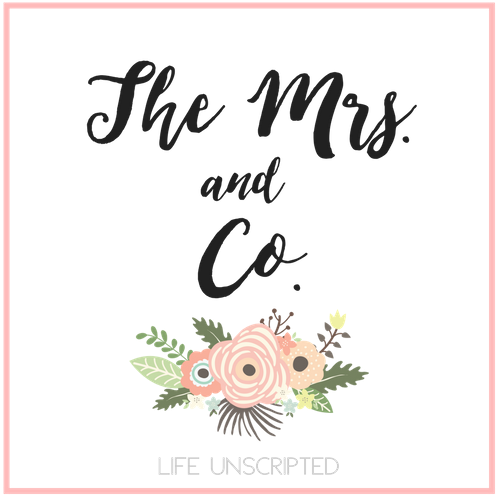 Lip Sense - The Mrs. & Co. So I was approached by a follower of mine about trying out Lip Sense and I will be honest with you, I really wasn't interested. I'm really not a huge fan of the businesses where the sellers just bug and bug and bug you to buy their product. Seems that most businesses where the seller works off commission are that way. It can be such a turn off! Well first off, Robyn never bugged me. Huge plus! She sent her email and waited for me to contact her. Second off I wasn't interested because honestly I don't care about lipstick. It's a miracle if I have time to put anything on in the morning and if I do it's going to be a very neutral color because the rest of my face is bare and having a bright lip just wouldn't make sense. But alas, I gave in and decided to give Lip Sense a try. I apply the color in the morning, regloss throughout the day, and it's still there when I go to wash my face at the end of the day. Just put some witch hazel on a cotton ball and rub it right off. It did take some getting used to as the color doesn't feel like lipstick. It's like a lip stain (called a liquid lip color) and then the gloss on top keeps your lips hydrated and the color covered. So take a look at some of the colors I got to try out. Love this color! Every girl needs a good red in her life! The starter set comes with a color of your choice, a tube of gloss, and a tube of oops! fixer. That's what I call it. So if you accidentally get color where you don't want it (happens with the brighter colors) you just rub on the oops stick, use a q-tip and it comes right off. Great neutral color for those who don't want something over the top. one of my favorites! I will be adding it to my collection for sure! Not a fan of the dark color unless you have formal event to go to. Not an every day color for me. A great color for summer time! Has more coral/orange in it. I love this red/pink color. Gives your lips that little pop! Also I'm wearing their tinted moisturizer here. LOVE that stuff! It's light and airy and covers blemishes really well. It just gives that smoothed out look. Great neutral, but I wasn't a fan. Too brown for my taste. This was a mix of Aussie Rose and Sassy Z. Sazzy Z is my go to FAV color! I love that you can mix the colors too. Since it's a stain they mix great! I also tried out their eye make up line as well. Here I wore the Sandstone Pearl Shimmer shadow on my lids and a darker shadow (Mocha Java) on my crease. I wasn't as big of a fan of the eye shadow. It felt wet going on until you rubbed it in. Wasn't my thing, but was still very pretty! In the end I wish I hadn't drug my feet and tried it sooner. As a mom who doesn't have a lot of time to get ready in the morning, having some lip color really does go a long way in making you feel like you put some effort into yourself for the day. Want to give Lip Sense a try? Email Robyn at robynspencer12@gmail.com. If you join her Facebook page Spencer's Sassy Smooches she will give you 10% off and free shipping! Want to host a party? Get 20% off and a free color for hosting a party! It's so easy to host a party. Do it on Facebook! She will get you hooked up! I promise you'll be thanking me. It's such a great product! I know you mentioned you didn't like the dark shade unless you had a formal event but it looks great on you! I like neutrals myself. You looks so pretty!! I like your natural looks. Thanks to share this. I believe makeup is an important part of women's life. I can't imagine a single day without my makeups. I love to use my favorite Liquid Matte Lipstick for my lip.